If there’s anything which could truly derail the Cleveland Indians‘ hopes of not only making it to the postseason, but also going on a deep run, it’s an injury to the starting rotation. Seen as the Tribe’s biggest weapon, the starting pitching is what has the team gunning for an AL Central crown. At the same time, should any sort of issue arise with one of Cleveland’s many stud starters, things could get dicey in a hurry. It sure seems like such a development has taken place with Danny Salazar. 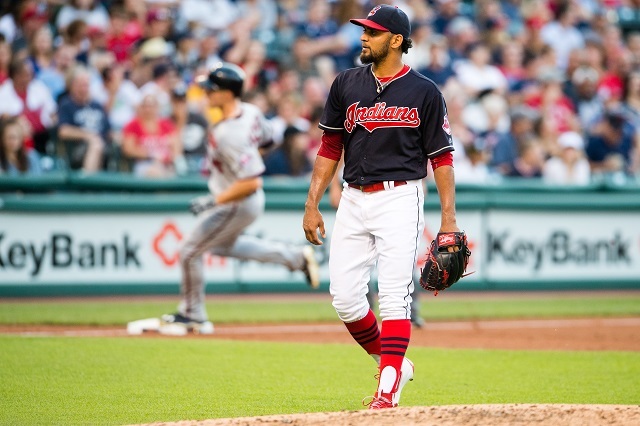 A player who looked like a legit Cy Young candidate heading into the All-Star break, Salazar is now struggling mightily. Today, he was placed on the 15-day DL with elbow inflammation, an alarming development the Indians need to be very concerned about. Through the end of June, Salazar was looking almost unhittable. He had a 2.22 ERA, had only allowed more than three runs in a start just once and was collecting strikeouts left and right. Since the completion of June, though, Salazar has been a hot mess. Outside of a solid start against the Kansas City Royals, he’s been shelled often. He has a 7.50 ERA in his last five starts, giving up a combined ten runs in just six innings across his last two alone. This includes last night’s match-up against the struggling Minnesota Twins, which certainly looked like the perfect elixir for his issues. After giving up six earned runs on a stunningly low two innings pitched, it only ended up making things worse. It was how he pitched in said dumpster-fire of a start which had everyone getting worried. Salazar was rushing through his windup, topping out a good three-to-four MPH less than what’s usually expected from him. He couldn’t locate a pitch to save his life, instead throwing inaccurate and flat meatballs Minnesota jumped all over. To be frank, Salazar pitched cautiously last night, as if afraid to aggravate an injury. After the game, he claimed something was wrong with his elbow, a development confirmed by today’s MRI. This isn’t the first time Salazar’s elbow caused an issue this year. He’s already been scratched from a start because of it earlier this season, and also didn’t pitch in the All-Star game due to soreness. Now, with the news of his being sent to the DL, there’s certainly cause for alarm. Salazar is easily the one pitcher Cleveland can’t afford to lose. While all five members of the rotation have contributed in a big way this year, Salazar has been the most consistent. Carlos Carrasco and Corey Kluber have each settled down a bit, but the former has been burned by bad defense lately while the latter is still susceptible to rough starts. I think we can all agree Josh Tomlin is significantly out-doing himself this season, and it’s tough to rely on him staying this successful through the rest of the year. Additionally, Trevor Bauer is in the midst of a slump, giving up 15 earned runs across his last four starts. It’s clear that Salazar has been the ace of the bunch this season, and if he’s hurting, it puts Cleveland in a tough spot. At the moment, there’s no sign this is a significant injury. That said, it’s tough to believe skipping a couple starts will make the inflammation go away for good. As mentioned, he’s rested a couple times earlier this year, yet the injury remains persistent. It goes without saying Salazar’s presence is much more important later in the year than it is now, so you can live with his missing a couple August starts. The Indians will be forced to withhold their continually shrinking division lead while he recovers, but have options in Mike Clevinger and (unfortunately) Cody Anderson to pick up the slack. This is, of course, if a brief respite is all Salazar needs to recover. Should this issue keep popping up throughout the year, Cleveland could be put in quite a predicament. Salazar’s presence is key if the Tribe wants to put together a long playoff run. If his elbow continues to ache despite getting this breather, the Indians’ road to the postseason gets a much more difficult.